What kind of Brexit do people in Cowbridge want? On the day MPs debate eight proposals on the future of Brexit, people on the streets of Cowbridge have been giving their views on what they want to happen. In the 2016 referendum, the Vale of Glamorgan produced one of the closest results in Wales - and the UK. There were just 1,053 votes in it, but 50.7% of voters in the county chose to Remain, while 49.3% wanted to Leave. So what do they think now? 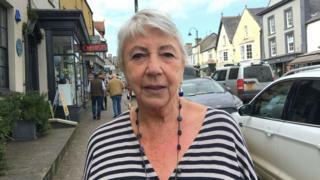 Mary Ballantyne, 75, a former wine merchant from Cowbridge, said she wanted a "no deal" for the UK's future. "I didn't vote to come out with no deal, I voted to come out and have a sort of fair deal," she said. "But a fair deal isn't happening. I don't want another referendum - that's not democratic. "We voted to come out, so come out." She added that she did not think the wine business would be affected by Brexit: "Do you think France is going to stop selling me their wine? No chance." Stationery store-owner Sally Stephenson said their margins had been "squeezed phenomenally" since the referendum. "Within six months of the referendum, all our cost prices went up anything between 15% and 25% because of the crash in the value of the pound," Ms Stephenson explained. "A lot of the stock that I sell here is sourced either from European countries or from the US - so anything that affects the exchange rate has a direct impact on our cost price. "I've lost three members of staff. We did have a toy shop down the road and we've had to close that now in order to focus all our energies and save all our money on keeping The Pencil Case afloat. "It's impossible to plan in this current environment, a nightmare." Former local government worker Keith Bennett, 70, said he believes "we belong in Europe." "If everything that we're proposing to leave the EU is going to be catastrophic, why are we going to leave?" he asked. And Emma Parsons-Reid, from St Fagans, said "a referendum is a referendum" and that she wants the UK to leave with no deal. "We voted out, and whether you voted remain or leave, a referendum is a referendum and I think 'what are we scared of'?" she said. "Employment has never been so high - we've had Brexit hanging over us for two years and I think we're doing really well." The 52-year-old is starting up a new cleaning business and is positive for the future: "I think there's plenty of business owners who want out as well. "We were out of Europe once, why can't we do it again?"